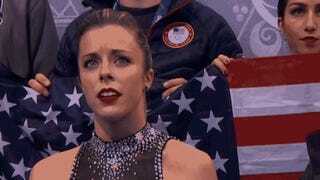 It's safe to say American figure skater Ashley Wagner was expecting a better score than that. Her face—along with all pretense—dropped after seeing the judges' thoughts on her short program in ladies team competition. For the record, Wagner received a score of 63.10, putting her in fourth place at the time behind Mao Asada, a Japanese skater who fell during her routine. Wagner assumed she'd get a much better result. And now, she's internet-famous for her disappointment.